There are 35 comments on New FAN section! Met IZ back in 1983 in Keaau, Hawaii (Big Island). Never forgot him. Fan from Kaneohe, Hawaii, living in Crowley, Texas. I have loved IZ for years. Just found this website and glad that I am able to be a part of his fan base. There has never been and will never be anyone else like this beautiful man. Happy Birthday IZ…you live on in the hearts of many. Your music is legendary, and every time I see a rainbow I smile for you. i love my idol so much!from philippines!!! Very special, very musical, very IZ. Today marks the day, this Gentle Giant was taken as his voice was needed back in heaven. Will never forget his fabulous voice. Aloha from Connecticut on the mainland. May the spirit of IZ return to us soon. Meanwhile, his music is magic, and he gets me through my day. Some offer us notes, but IZ offered us true music, the music of spirit. I fell in love with IZ’s voice the first time I heard it. What a beautiful voice and a talented man. 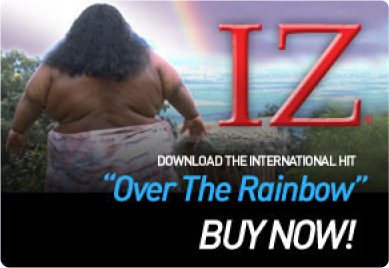 The fist time i listened to Iz, was when I was in Hawaii on vacation.I was hooked the first time I heared his voice.Truely a amazing singer. soulful,yet a very melodic voice.When I listen to his recording,they stir my emotions . Iz left us to soon.But his spirit is still with us.Thanks for sharing your God given talent with us Iz. I have my bumper sticker on my car now for over a year…and I saw another car with a sticker at the local mall!!!! I waited for 45 minutes just to say hello to a person that has been touched by IZ music as well! I was SOOOO EXCITED!!!! Please put me on the map!!!! Since the moment my son was conceived we played Iz songs so he could hear them inside his mom’s belly. Especially Somewhere Over the Rainbow. T o this day it is pure magic. Thanks IZ! Live Forever! According to MATTHEW: 24. We are about to see this event soon. That chubby little man (well, not little), but mostly with his uekele AND beautiful voice, and his take on music… Do you know that when you type in Kid Rock or uncle Kracker. on Pandora..eventually, His Music comes up? it’s beautiful, he’s beautiful, Y’all are beautiful. I bet I could never underdstand how it is all related. Here’s what i do know: I love people, I love wanting to TEACH my daughter that people count, BUT, I want to show her that life counts. That’s VERY hard in the society she’s used to. How do I make it her realize what is all ready there? IZ YOU WERE AN INSPIRATION. I KNOW YOU ARE LOOKING DOWN ON US FROM HEAVEN. YOU DA MAN!!!!!!!!!!!!!!!!!!!!!!!!!!!!! A friend of mine sent me “IZ” singing ‘Over The Rainbow” with the video to me on Face Book. I told my friend I have NEVER heard it sung any better than by the original artist Judy Garland who sang it in the “Wizard of OZ” movie. His voice and the way He sang it reached deep into my soul and lit a fire within me. I felt more alive than I ever did that is how much He touched me. She wrote back and informed me that is was His Ashes that were being spread into the Ocean. This is now word for word what I wrote back to her. “Thank you so very much for sharing the information that it was His Ashes being spread in to the water. I am saddened by the news that He was called home. Most definitely way too young and far too soon. I just know in My Heart that the Creator has some divine plan for him. I too when it is my time to be called home will have my ashes spread into the Ocean and now I have chosen the Artist and the song that will be played. Israel Kamakawiwo’ole “Iz” HQ has not just touched my heart he is a part of me now for in my heart he continues to live. I am Native American, Lakota Oglala Nation, known by the name Sioux. I send you Blessings for sharing the video and for writing to me to share that the ashes were his. He is at peace. It is His loved ones and whose lives He has touched and will continue to touch through His music that He will be Remembered till the Sun no longer rises in the sky. I am more than a new fan, I am spiritual connected to Him now. As Your ashes spread across the world so has your music. I will be purchasing His CD’s. His voice brings comfort and meaning to life. Mahalo, Israel Kamakawieo’ole “IZ” HQ. Your humble Friend Paulette My location is in the United States Of America, Hazlet, New Jersey. Love Iz’s music so much. Just sorry never got to see him perform live. One of my most favorite songs is the powerful “E Ala E”. always brings me to tears. Rest well, sweet man! A beautiful voice, a loss to the music Industry. I first visited Hawaii in 1995 and from that moment I was convinced that God created the islands for Himself. On my visit I walked in to a local music store and asked what the Hawaiian people listened to. I was quickly pointed to Brudda IZ and I have always been thankful. Just the mention of his name makes me long for Hawaii. I may never see Hawaii again but I hope to see and hear Brudda IZ on the streets of Glory. Aloha from Chatsworth Georgia!